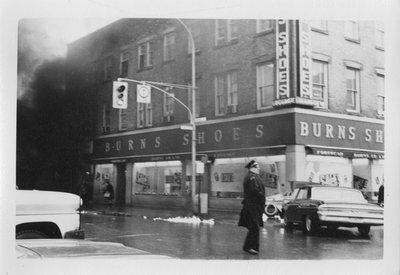 Black-and-white photograph of damage to local Oshawa businesses. Two cars have also collided in front of Burns Shoes. A fire broke out on the evening of Tuesday, 10 Jan 1961, on Simcoe Street, South of King.. More than 120 firefighters and 11 trucks from Oshawa, Whitby, Pickering, Brooklin, and Bowmanville were called in to fight the blaze, considered the worst fire in Oshawa's history (at the time). The fire appears to have started above the Fashion Village shop and spread quickly. It lasted 15 hours and the damages were estimated at $500,000.